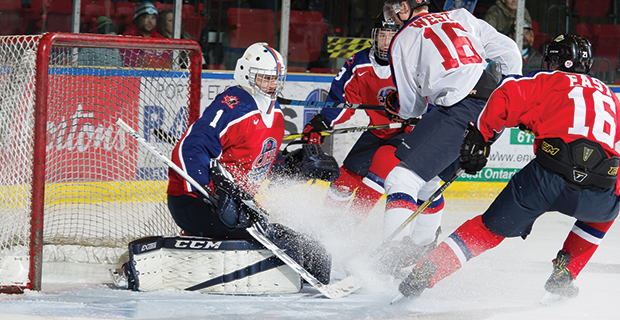 Two days before the top major junior draft-eligible players will suit up in front of scouts in Guelph, Ont., the top 40 Canadian Junior Hockey League (CJHL) will showcase their talents 45 minutes away in Mississauga. Each of the players chosen to participate in the CJHL Prospects Game were selected through the efforts of NHL Central Scouting and are currently among the top 40 CJHL prospects heading into the 2018 NHL Draft in Dallas. Joe Martin, the head coach for Team West, said his role as coach is different since it’s equal ice time for all and the lines are predetermined by scouts. Despite the presence of top end talent, Martin says he will be pushing players to showcase everything for the scouts, including hustle. “I know it’s an All-Star game and Prospects game, but they got to get rid of that mindset if they have it. You’ve got to go out there and show that you’re willing to win by how hard you work and how hard you compete, and all the guys on our roster have a great skillset. That will shine through, as long as the work ethic is there, and that’s what I’ll focus on,” he said. These players come from all across the country, as far west as Nanaimo, B.C. and far east as Bridgewater, Nova Scotia from 10 Junior A leagues. Beyond the game there is also testing both on and off the ice. Three players in the tournament rank inside ISS top 100 rankings - Team East’s Jack McBain from the OJHL’s Toronto Jr. Canadians, plus Team West’s Jonathon Tychonick of Penticton in the BCHL and Jacob Bernard-Docker of Okotoks in the AJHL. McBain, a forward, is ranked one spot ahead of Tychonick at 28. He has 43 points in 39 games to rank in the top 20 in OJHL scoring. Next year, he’s off to Boston College. Despite being drafted 12th overall by Saskatoon in the 2015 WHL Draft, Tychonick decided to go the Jr. A and College route and will head to the University of North Dakota next fall. With 26 points in 32 games, his year has been steady. Just a few spots down at No. 40, Jacob Bernard-Docker has been a fast riser in rankings. He’s poised to join Tychonick at UND next season, but right now he’s a big part of the AJHL-leading Oilers and currently leads all blueliners in the league in goals with 14. Both Bernard-Docker and Tychonick won gold with Team Canada West during December World Junior A Challenge. Martin was an assistant with the team there. McBain was on Team East that failed to medal. Along with these three players, several others recently laced up in the WJAC with Canada West or East. The WJAC was the main spot for scouts to watch these players ahead of naming them to the team, along with games in their respective leagues. It will be a highly attended event by scouts from both the NHL and college ranks. Each team will also have a former NHLer as a guest coach. Team East has Rick Vaive behind the bench, while Maple Leafs legend Wendel Clark will be with Martin and Team West to inspire the players. Team West has won the matchup seven times to East’s five. Martin’s final words ahead of the game gave a sense of what’s at stake.